Just as 4K settles in - 8K is on the way! 8K resolution represents 7680 x 4320 pixels (4320p - or the equivalent of 33.2 Megapixels). 8K is 4 times the detail of 4K and is 16 times more detailed than 1080p. What makes 8K significant is that with TV screens getting larger and larger if you sit closer to get that immersive viewing experience, the pixels on 1080p and 4K screens can become a visible distraction. However, with 8K, the screen needs to be extremely large to "expose" the visible picture structure. With the amount of detail that 8K provides, even if you are only a few inches away from a screen as large as 70-inches or more, the image appears to be "pixel-less". As a result, an 8K TV is perfect for even wall-size movie viewing, as well as for displaying fine detail, such as text and graphics on average and large size PC monitors and digital signage displays. 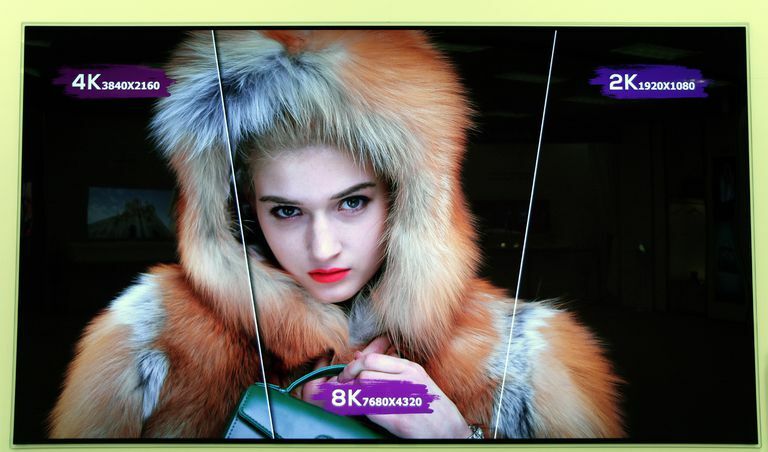 8K televisions are in development or actual production from a variety of manufacturers including, but not limited to, those made by LG, Samsung, Sony, Toshiba and Hisense. As great as it seems, especially for professional applications, targeting the consumer market is not that easy. With billions of dollars having already been invested by broadcasters, manufacturers, and consumers on currently available HDTV broadcast technology, 4K TVs, and source devices, and with 4K TV broadcasting just now getting off the ground, widespread availability and use of 8K is a way off. However, behind the scenes, preparations are being made for a consumer-targeted 8K landscape. One of the leaders in developing 8K for TV broadcasting is NHK of Japan which has proposed its Super Hi-Vision video and broadcast format as a possible standard. This broadcast format is not only intended to display 8K resolution video but can also transfer up to 22.2 channels of audio. The 22.2 channels of audio can be used to accommodate any current or forthcoming surround sound format, as well as providing a way to supply multiple language audio tracks - which would make universal worldwide TV broadcasting more practical. As part of their preparation, NHK is aggressively testing 8K in the TV broadcasting environment with the eventual goal to provide 8K broadcasting feeds for the 2020 Tokyo Summer Olympics. On December 1st, 2018, NHK began 8K TV broadcasting in Japan starting with a single channel via satellite transmission. To receive the signals, not only is an 8K TV required but also a dedicated satellite dish and receiver. However, even though NHK is able to provide the 8K broadcast feeds, another issue is how many partner broadcasters (such as NBC – the official Olympics broadcaster for the U.S.) will be able to pass them along to viewers, and will those viewers have 8K TVs and other required equipment that may be needed to receive them? In order to accommodate the bandwidth and transfer speed requirements for 8K, physical connectivity for forthcoming TVs and source devices have to be upgraded. To prepare for this, an upgraded version of HDMI (ver 2.1) has been made available to manufacturers that can be incorporated not just in TVs and source devices but switchers, splitters, and extenders. The speed of adoption is at the discretion of manufacturers, but it is intended that TVs and home theater receivers incorporating this upgrade will start appearing on store shelves in late 2018 or early 2019. In addition to upgraded HDMI, two additional physical connection standards, SuperMHL and Display Port (ver 1.4) are also available for use with 8K, so keep a lookout for these options on forthcoming 8K devices, especially in the PC and smartphone environment. Just as with 4K, internet streaming might get the ball rolling ahead of both physical media and TV broadcasting. However, there is a catch - You need a very fast broadband internet connection - upwards of 50mbps or higher. Although this is not out of reach, consider how fast watching a bunch of 1-hour TV shows or 2-hour movies will eat up any monthly data caps as well as hogging bandwidth that may prevent other family members from using the internet at the same time. Also, there is a lot of inconsistency with regards to broadband speed options available to consumers (there are areas of the country where 50mbps is wishful thinking). So, even if you fork out the big bucks for an 8K TV, you may not be able to access the internet speeds needed to take to watch any offered 8K streaming content. That being said, both YouTube and Vimeo offer 8K video upload and streaming options. Of course, even though hardly anyone can watch the videos in 8K currently, you can access 4K, 1080p, or lower resolution playback options of the provided 8K content. However, once 8K TVs start finding places in TV viewers homes, YouTube and Vimeo are ready, and, hopefully, other services (especially ones that already offer 4K streaming, such as Netflix and Vudu), join in, provided they have access to 8K-produced content. In terms of 8K TVs and displays, very little has hit the market for consumers in the U.S. So far there is a $4,000 32-inch PC Monitor from Dell, four models from Samsung ranging in size from 65 to 85-inches starting at $5,000, two models from LG, and two models from Sony. Also, Sharp is producing and marketing a 70-inch 8K TV in Japan, China, and Taiwan, with pending availability in Europe (no word on any possible U.S. availability). The set carries a U.S. price tag equivalent of about $13,000. 8K is also making slow inroads into the video projection space, with JVC (4K with eShift to achieve 8K — about $18,000) and Digital Projection (Native 8K — $400,000), with market-ready models. Another application for 8K is in the Glasses-Free 3D TV space. With the vastly increased number of pixels to work with, in combination with the larger screen sizes that are desirable for an immersive 3D experience, 8K glasses-free 3D TVs can provide the needed detail and depth required. Although Sharp and Samsung have both shown prototypes in recent years, Stream TV Networks has provided the most impressive demonstration so far. The potential cost may be an issue for consumers (and, of course, there is the available content question). However, 8K-based glasses-free 3D definitely has implications for commercial, educational, and medical use. Another area of preparation for an 8K World, is the use of 8K resolution, along with video processing techniques, such as HDR and Wide Color Gamut in film restoration and mastering. Some movie studios are taking select classic films and preserving them as 8K resolution digital files that can also serve as pristine sources for mastering to Blu-ray/Ultra HD Blu-ray Disc, streaming, broadcast or other display applications. Even though the main current high-definition formats in use currently are 1080p and 4K, mastering from an 8K source ensures the best quality transfer available. Also, mastering in 8K means that films or other content would not have to be remastered every time a new high definition format comes into use for either theatrical or consumer applications. Regardless of the ability to transmit and display 33-million pixel 8K resolution images on a TV screen, the key to its acceptance will be affordability and the ability to provide viewers with actual native 8K content. Unless TV and movie studios produce or remaster content in 8K and have distribution outlets (streaming, broadcast, or a physical medium), there will be no real incentive for consumers to once-again dig into wallets and spend their cash on a new 8K TV, no matter the price. Also, while 8K resolution may be applicable for very large screen applications, for screen sizes less than 70-inches, 8K would be overkill for most consumers, as well as the fact that most consumers are happy with their current 1080p or 4K Ultra HD TVs. On the other hand, those that do end up deciding to make the jump to an 8K TV as soon as they start becoming available will have to settle with viewing upscaled existing 1080p and 4K content for almost all their TV viewing for the next few years, which might look very good, but won't deliver a full quality 8K viewing experience. As the road to 8K reveals more developments, this article will be updated accordingly. Is There a 3D Tv That Doesn't Require Glasses?